The life of an adventurer is one of unexplored places, unexpected monsters, and unforeseen dangers. There's so much to do and so much to see, and you can't do any of that if you're dead. 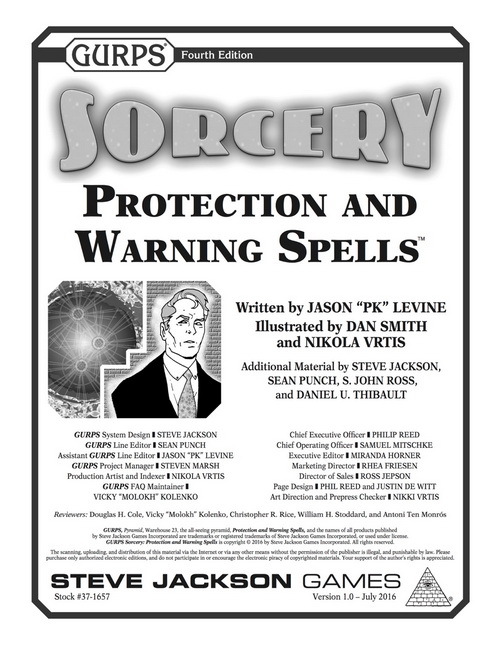 That's why all but the most foolhardy sorcerers need GURPS Sorcery: Protection and Warning Spells. A total of 38 new spells, inspired by their counterparts from GURPS Magic and GURPS Magic: Death Spells. Learn how to preserve your Freedom, block with your Iron Arm, or conjure an Utter Dome. Clear descriptions and rules for every spell, to prevent arguments at the gaming table. Know exactly how much damage your Resist Fire or Force Wall can stop, how quickly your Atmosphere Dome can purge gases, and more. New traits and guidelines to handle edge cases. Learn how internal defenses work, how Sealed can prevent corrosion, and what counts as a "magical creature" for the purpose of Force Dome and Force Wall. Full GURPS Powers statistics for each spell, enabling tinkerers to reverse-engineer and tweak spells to their hearts' content! 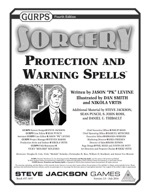 The best defense isn't a good offense, it's GURPS Sorcery: Protection and Warning Spells. Keep your guard up! For the underlying system powering this supplement, make sure you have GURPS Thaumatology: Sorcery.